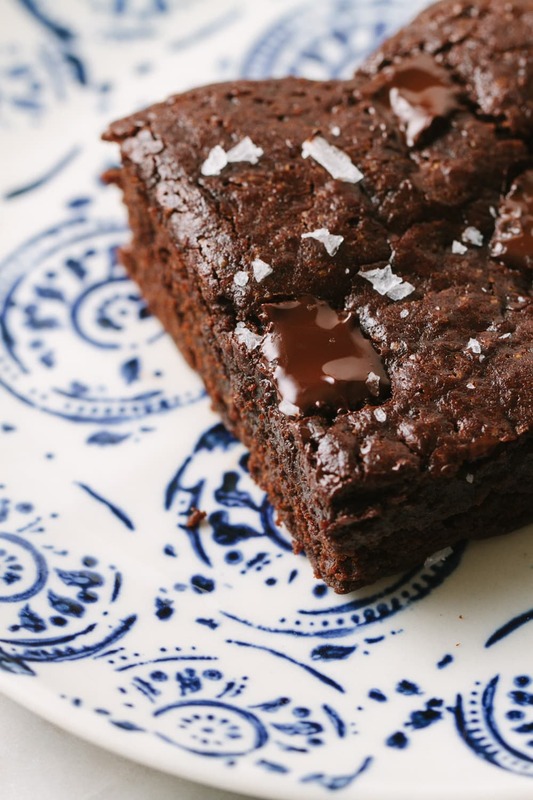 These vegan brownies are indulgent, fudgy, chewy and gooey in all the right places and studded with chocolate chunks. 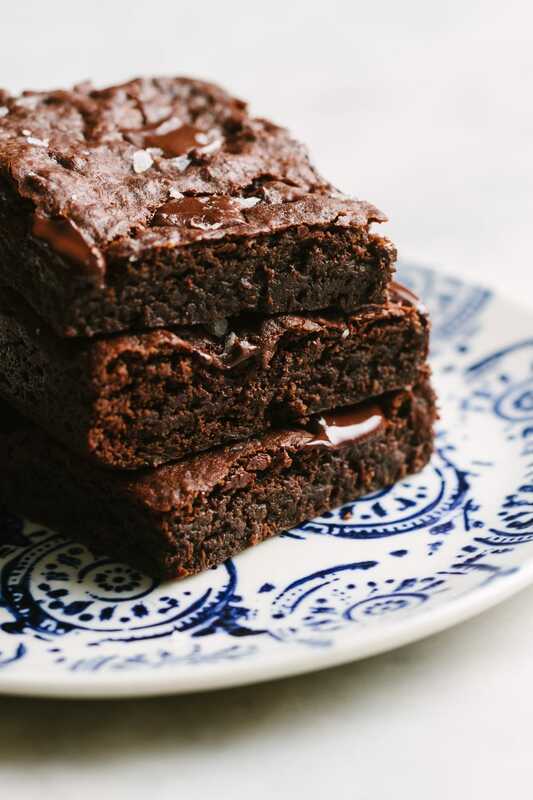 They are my favorite chocolate brownie recipe! Good old-fashioned, moist and fudgy brownies made from scratch have landed a spot in the ever expanding collection of vegan desserts! These classic homemade vegan brownies are completely dairy free, egg free, healthy-ish, and downright delicious! 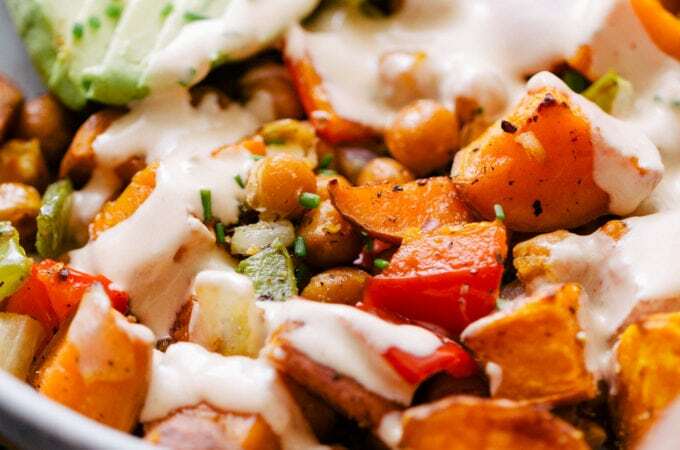 Easy to make, you can whip up a batch in about 45 minutes. Rich and decadent, without being overly sweet, I think you’re going to love these chocolate-y brownies as much as we have. They’re pretty much fail-proof too. 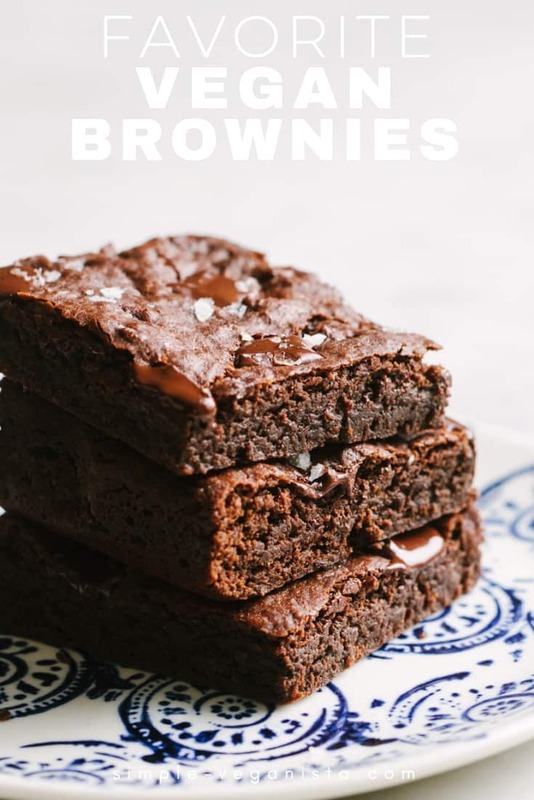 I have made a 4 batches of these vegan brownies over the last few days (with minor tweaks here and there), and the whole family loved them all! 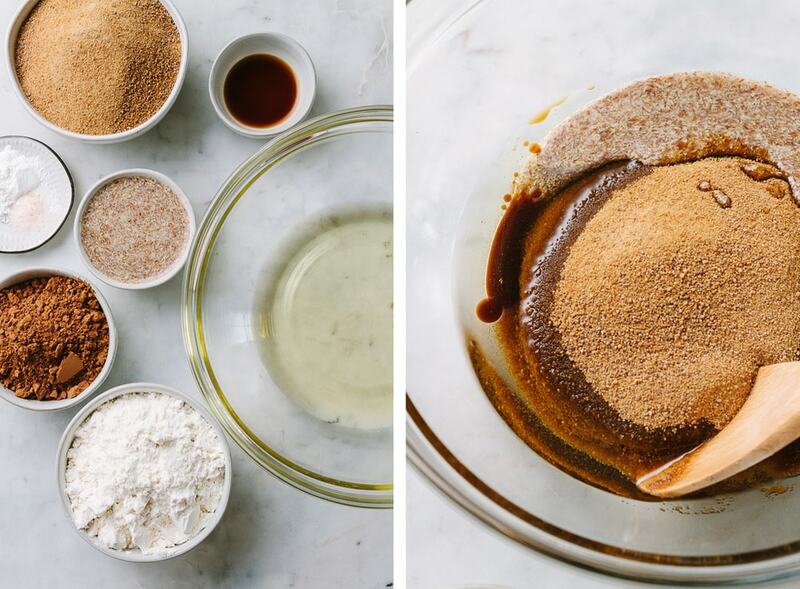 It only takes a few simple ingredients to the make my favorite vegan brownies. Flour – I used white whole wheat flour here, but all-purpose, spelt or whole wheat pastry flour would also work. 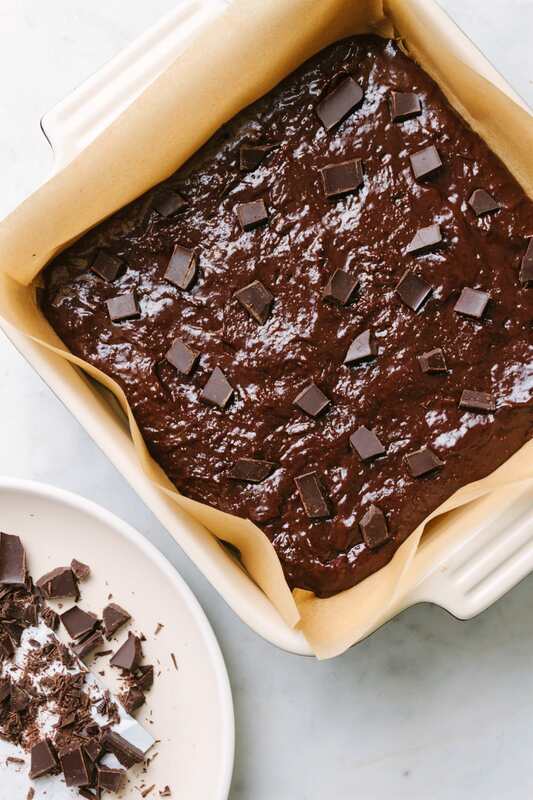 Make these vegan brownies gluten-free by using all-purpose GF flour. Cocoa Powder – Seek out cocoa powder with no additives, it should 100% cocoa powder. Dutch or natural cocao is fine, and raw cacao powder is great too! Dutched cocoa is treated with alkaline giving it a deep dark chocolate color and milder taste, while both natural cocoa and raw cacao are free from any processing and lighter in color. 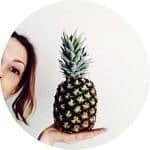 Sugar – Use pure cane sugar, white or brown, or coconut sugar (I used the latter because it’s not as sweet as other sugars and has a caramely flavor). If you prefer sweeter brownies, use pure cane sugars. Baking Powder – If you don’t have baking powder on hand, 1/2 teaspoon of baking soda will be fine. Non-Dairy Butter – I use Miyoko’s butter, it’s my favorite. I’ve used light flavored olive oil (as shown above), but any neutral oil will work. 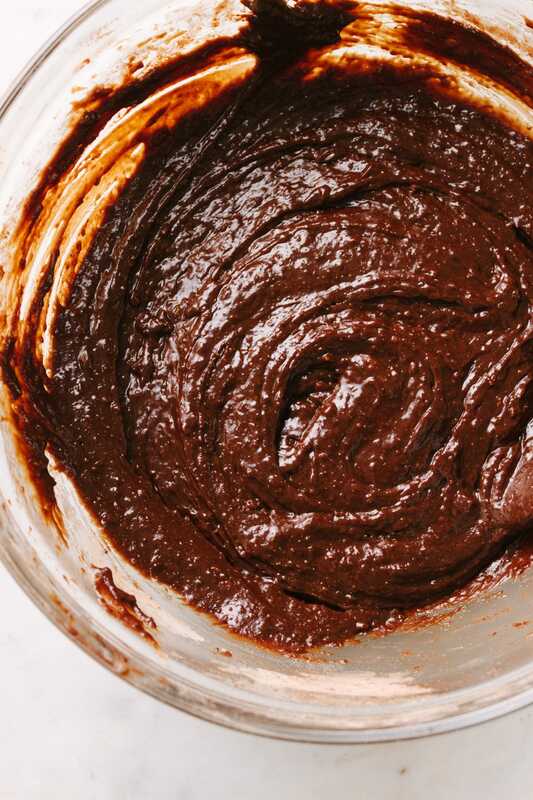 For oil-free vegan brownies, unsweetened applesauce is terrific! Flax Eggs – I love this handy bag of flaxmeal from Bob’s Red Mill (Target carries it a little cheaper, sorry Bob! ), it makes having flaxmeal on hand for flax eggs whenever I need them. Vanilla – And finally, a dose of vanilla takes just about anything chocolatey over the top! And for extra brownie love, add chunks of dark chocolate before baking and course sea salt after. It makes for gooey chocolate studded vegan brownie with just the right touch of salt to compliment the subtle sweetness. Complete perfection! Mix: Mix the wet ingredients until combined, add the dry ingredients, mix again. 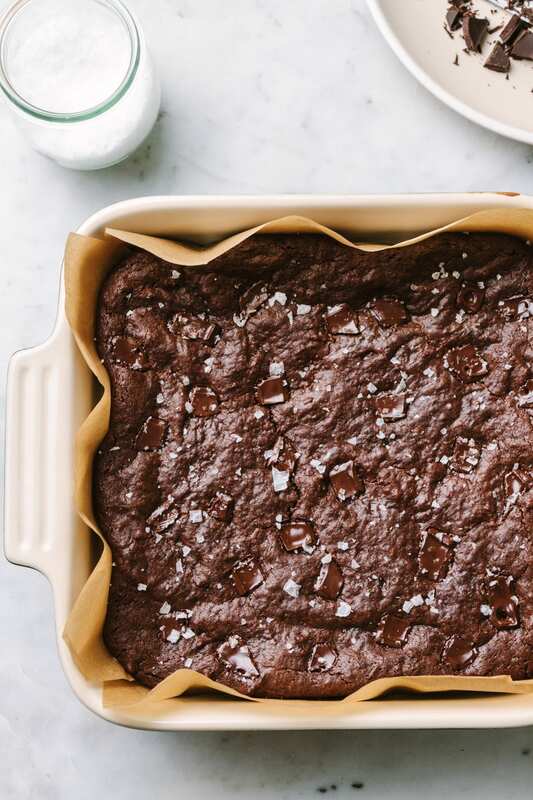 Pour: Pour brownie batter into a prepared 8 x 8 baking dish. Top with optional chocolate chunks. Bake: Place in center of the oven and bake for 25 – 30 minutes. While you’re waiting for the brownies to bake, enjoy scraping every bit of batter off the side of the bowl! And that’s it, easy to make vegan brownies, made healthy-ish! Use quality ingredients! With only a handful of ingredients, sourcing the best will make for the ultimate vegan chocolate brownies. Make sure your flax eggs have time to set, at least 10 minutes, before using. It helps to line your pan with parchment paper. Leave an overhang on the sides to create handles. This way, when your brownies are done, you simply lift by the overhang to pull out the brownies. I use these pre-cut sheets and cut one in half and placed crossed on each other, it fits perfectly in an 8 x 8. Wait for the oven to be completely preheated before adding the brownies, placing them in the center of the oven for even baking. Baking time will vary from oven to oven, so use your best judgement. A gooey, fudgy vegan brownie that’s a true crowd-pleaser! These are great for parties, potlucks, or just because you deserve to treat yourself to something wonderful! 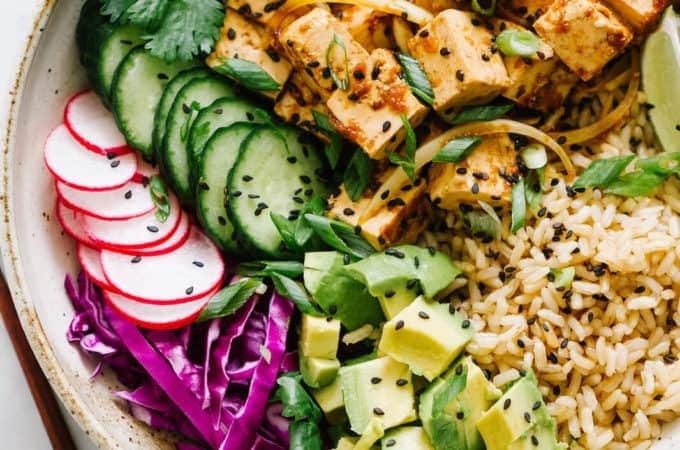 Serve as is, with a side of coconut whipped cream or non-dairy vanilla ice cream. Also, great paired with either a tall glass of ice cold no-dairy milk or hot cup of coffee! See all Chocolate recipes on TSV! 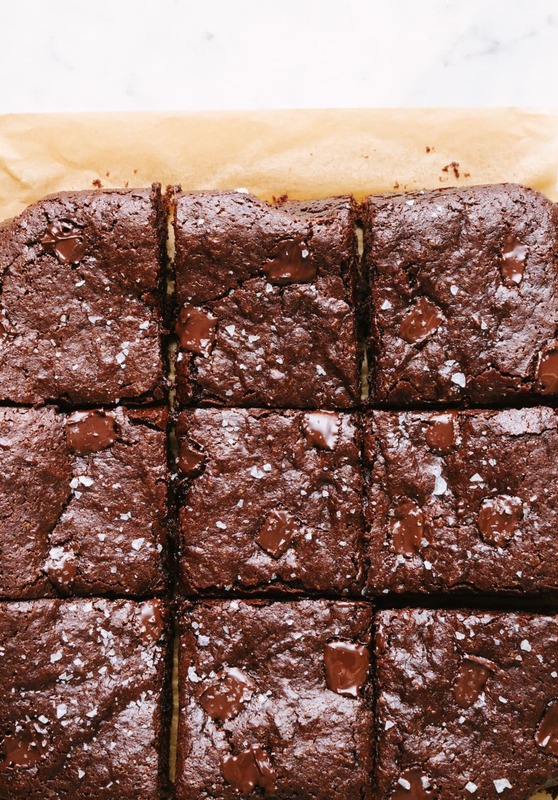 If you try these easy vegan brownies, please let us know! Leave a comment and rate it below. I love to hear what you think, or any changes you make. 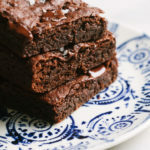 My new favorite brownie recipe! 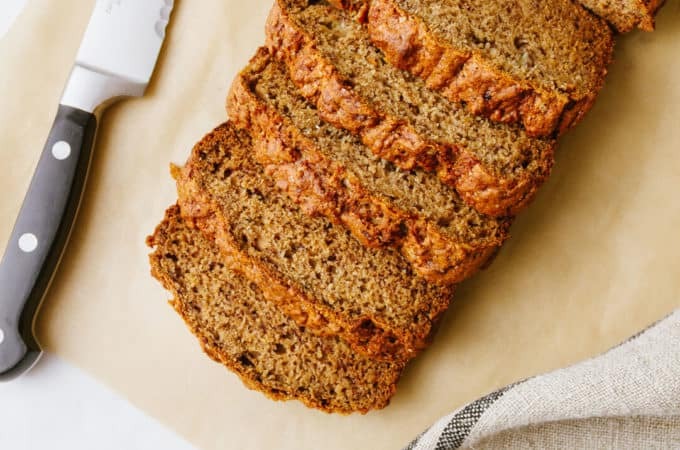 I made these gluten free using the Bob’s Red Mill 1to1 flour, a combo of applesauce and Miyoko’s butter and carob powder and it came out perfect! Love the consistency and it held up well when stored on the counter in a closed container. Thank you! Have you ever tried baking in a muffin tin for quick individualized portions? If so how would you adjust baking time? No I haven’t, but love the idea! I would say to bake for 15 minutes, give or take 2 minutes. Would love to know how they turn out. Sounds like a good future recipe! 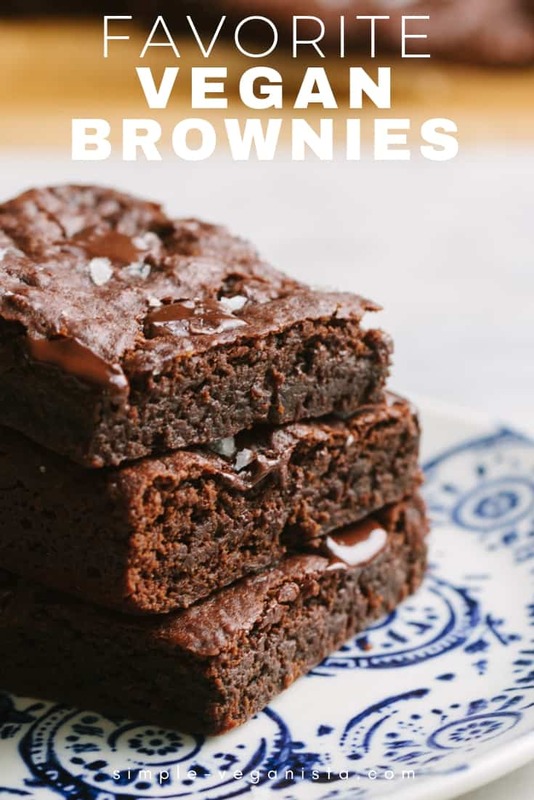 Definitely going to have to give these a go, I love making vegan brownies!